SuperFogeys - Who’s excited for Iron Man 3? Greetings, SuperFans! It’s your Friendly Neighborhood Fogeys artist here. Another summer blockbuster movie season is fast approaching and one film I’m really looking forward to this year is Iron Man 3. Recently a new teaser poster was released which I think is heads and shoulders above most movie posters these days. If you haven’t seen it yet, check it out here. My first impression of this poster is how it would make for a cool retro Mighty Marvel comic book cover. So, I tried my hand at drawing the classic Iron Man, worked some Photoshop coloring magic, added some Marvel-esque cover copy, and slapped on an old logo to create this parody mock up of the Iron Man 3 poster. What do you think? 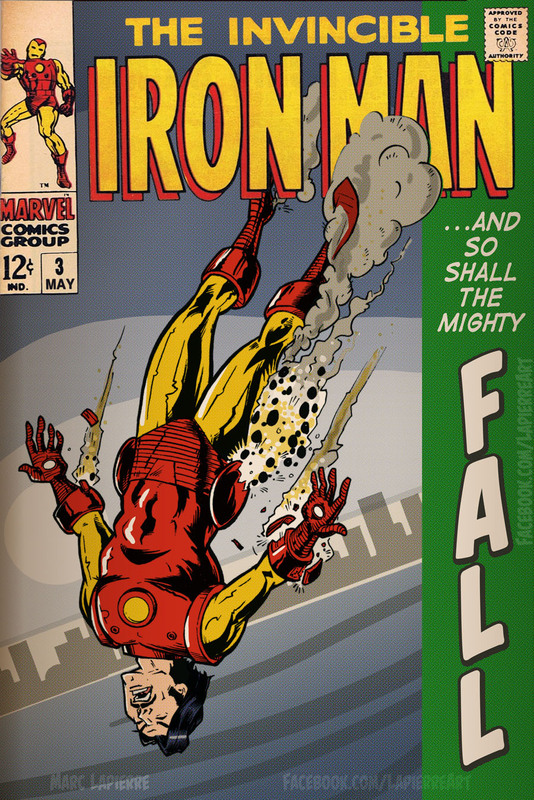 Credit where credit is due, the logo, Comics Code seal, and corner box are originally from the real Iron Man #3 first published in July of 1968. I changed the month to May to reflect the movie’s opening date. I’m a huge fan of the classic Marvel look from the 60′s and 70′s and creating this piece was both fun and educational for me. This piece serves as a little love letter to the Marvel Age of comics as well as to a great modern movie poster. 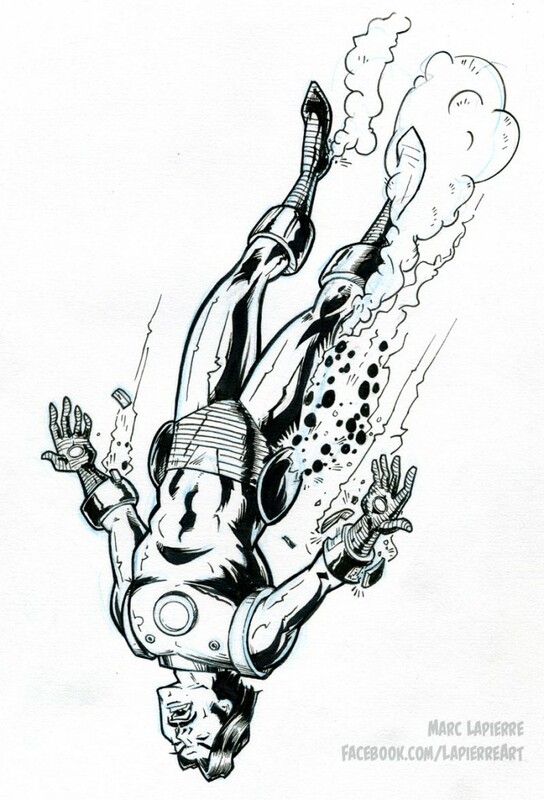 Here's a look at the original inks before all the Photoshop magic. If you want to see more of my art, check out my Facebook page HERE! That’s awesome! You’d get my 12 cents. Marc, this is a fantastic surprise. You executed this splendidly. Those old school covers really are my favorite and you pick of armor is spot on. Congrats on all the attention this is getting! How are you guys not snatched up by some big comic book industry is beyond me, your art and story telling are a great match. So glad I get to read Superfogies with you two behind the wheel. Whoa. A movie poster that evokes what actually happens in a movie, not just headshots or dramatic poses? Will wonders never cease? Also, bang-up job, Mr. Lapierre! I thought I was looking at an exact replica of an old cover, until I looked at the poster. Very nice, is this piece for sale? No. I won’t be selling this piece. This was done just for fun. I’m not looking to get sued. I’m glad everybody seems to dig it, though. Thanks! whooa man, kinda like it!